Here are some of the impossible structures, though they appear to be impossible for construction but they are made possible. These pictures have not been edited. Many think this can't be done. 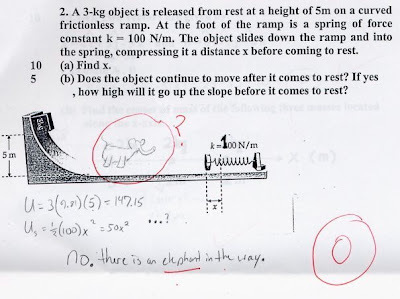 But it is actually possible! 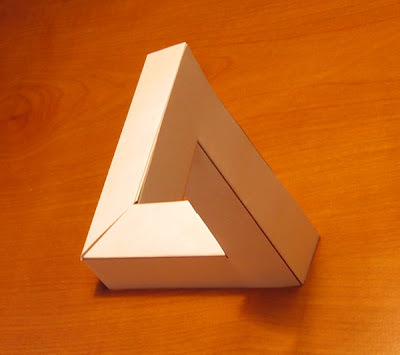 And if you wish to construct your own Penrose Impossible Triangle then just download and print the PDF. 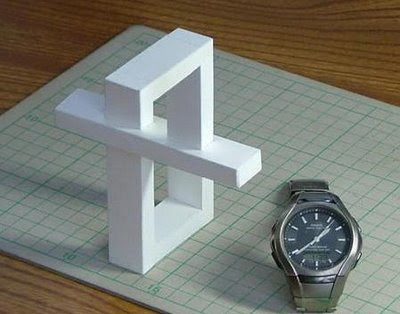 What more, you can change the dimensions as you like & even shade it or color it too. If you cover about 1/3 of the picture at either end, then the picture looks like any other ordinary picture of washer or ring. 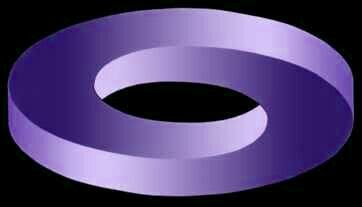 In this only two colors have been used just like Mobius, has only two faces. Top 10 Unique Computer Mices. It costs you about £12,400.00 / $24,180.00 USD. 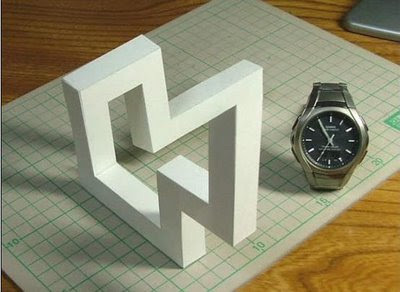 If you are willing to spend it then you can get it personalized with diamond initials of your choice. "The world's most expensive computer mouse, cast from 18 carat white gold and set with 59 brilliant cut diamonds. Choose from the beautiful "Diamond Flower" design and the "Scattered Diamond" design." World's Most Powerful Mouse: MX510 Performance Optical Mouse. Logitech's most powerful computer mouse ever, the MX510 Performance Optical Mouse. "Designed for computer gamers and other "power users," Logitech says the MX510 can take 5.8 megapixels of surface detail per second, deliver a 12-bit data bath and support acceleration up to 15g. The company claims that the finish on each mouse is completely unique, making it like a snowflake -- no two are exactly alike. The MX510 includes eight programmable buttons, including an Internet forward and back buttons aimed at being within easy reach of the thumb. 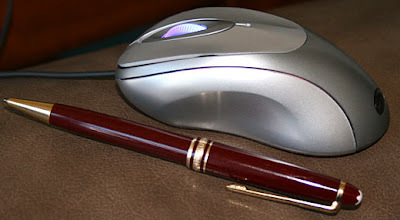 A Quick Switch Program Selector button is at the top of the mouse, which lets a user jump between open applications." How about going for this one? 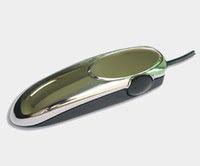 "The Slimouse is held between the thumb and middle finger and instead of the usual left and right buttons you get a front and back button to control with your index finger. The scroll wheel is on the side." This one is "smarter, faster, and fully loaded. Hyper-fast scrolling. Instant application switching. Touch to Search." Size matters, here is the worlds smallest laser mouse, "Sigma's Rotino". "Substance size the 1/4 of 30×70×20mm (width × depth × height), weight approximately 40g and general mice small-sized mouse. At the same company it has expressed the "mini car mouse". Small size, resolution is possible to change 1,000/2,000dpi, you say that frame rate 9,600fps and the high performance loads the laser sensor, job is possible in the space 1 of cards. Interface with USB, can equip the cord/code reel in the cable, can receive the cable the unused time." World's Most Unique Designed Mouse? 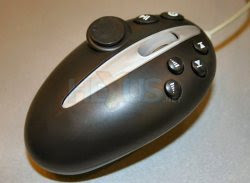 "This thing has all the controls you would expect to find on a media keyboard, but jammed onto a mouse for some reason. The "mouse" moves the only two buttons you really need on a mouse, the right and left click buttons, to the front conveniently located (NOT!) under the USB cable." A Silent mouse? "When you press down on the left-click and right-click buttons, it makes no noise whatsoever, but you can't feel any clicks, either. There's no tactile feedback at all. There's just this rubbery, bottomless travel that gives you no indication of when you've actually engaged that button." 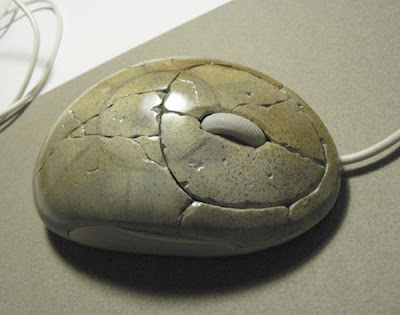 Russian designer Neko made this mouse from stone, "looks like the stone parts are polished/cut and glued to the mouse." 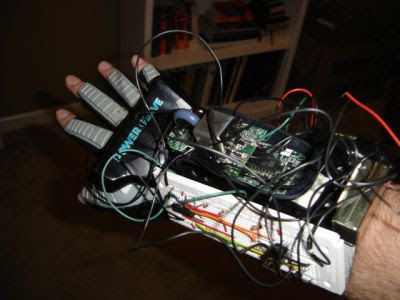 An old Nintendo Powerglove converted by Zerosign into a functional computer mouse. 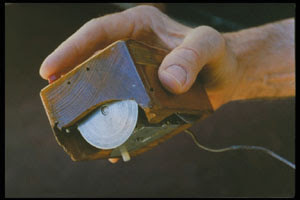 Here is the image of the first computer mouse held by Engelbart showing the wheels which directly contact the working surface. 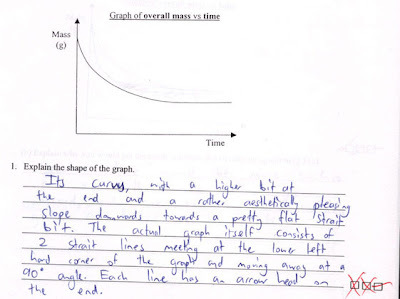 When is fast fast enough? Here are world's fastest gadgets, which one will you opt for? 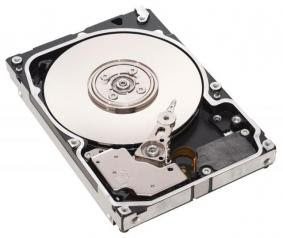 "Seagate's hard drive has a 15,000rpm, 2.5in 3Gbps Serial Attached SCSI (SAS). The Savvio 15K has a mean time between failures (MTBF) of 1.6m hours. New Savvios consume two-thirds of the power of 3.5in 15,000rpm drives and sport a seek time that's 12 per cent faster." Sony claims its drive to be the world's fastest DVD±R writer. "Sony admitted the availability of media certified for use at 18x was "limited", but it claimed the drive - dubbed the AWG170A - would write 16x discs at the higher speed. It also said the drive will write DVD-RAM discs as 12x. 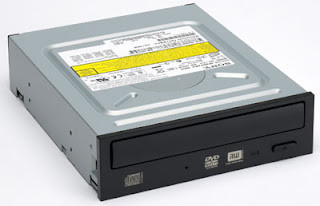 DVD±R DL discs are written at up to 8x, it added, the same speed the drive writes DVD+RWs. DVD-RW discs are written at 6x." "world's fastest DDR-2 production memory and it's from Corsair. Rated at PC2-10000, it's able to run at 625MHz using a total of 2.4 volts and possibly even more if you are lucky enough." "The ADU-610is powered by download speeds from the Internet of up to 7.2 Mbps this small modem makes wireless broadband accessible for PDAs, notebook, and even home PCs." 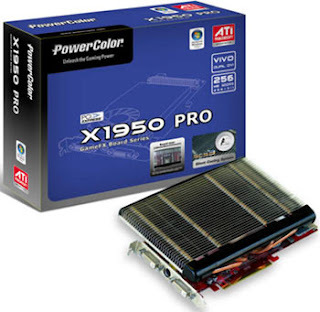 "This graphic card runs passively, at the same time, maintaining its original specifications, including: 575MHz core engine, 1380MHz effective memory speed, 256MB GDDR3, and 36 pixel processors. The X1950 SCS3 comes with VIVO, HDCP, and is Windows Vista ready." "It's a two--centimeter-wide featuring four patterned, gold-colored rectangles. 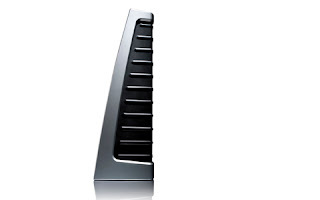 The chip's simple appearance belies its complex engineering and gives little hint that it could be the key to cheaply supplying the bandwidth demanded by a YouTube users"
"BenQ launched the world's fastest 19-inch LCD monitor, the BenQ FP93G X+, for PC and online gamers. The FP93G X+ features an ultra-fast 2ms gray-to-gray response time, a super-slim 13mm bezel and a high contrast ratio of 800:1." 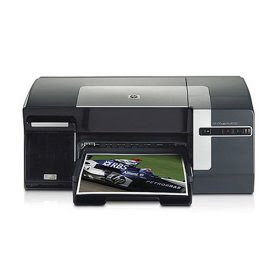 "HP's newest inkjet printer portfolio includes three new high-performance HP Officejet Pro All-in-Ones, three new HP Officejet Pro single-function printers and a new low-cost HP Officejet All-in-One for improved productivity." "Flextight X5 has been built for speed and scans 35mm originals at up to 8000 dpi and at a speed of 300MB per minute, making it the world's fastest, high-end scanner." Gigabyte's World's Fastest 3D Graphics Card: GV-RX195X512VB-RH. 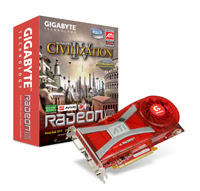 "Featuring the ATI Radeon® X1950 XTX, with state-of-the-art architecture which includes an ultra-threaded engine for outstanding shader performance and manufactured using an advanced 90 nanometer process technology, the GV-RX195X512VB-RH supports high speed GDDR4 memory, enabling it to performance with an incredible increase in gaming and video image processing speed." A 2-month-old known as Jie-jie, was born with one right hand and two left hands. 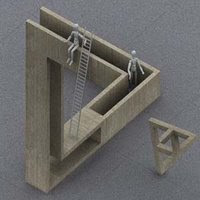 "How it happens? Van Heest estimated that one out of 200,000 babies are born with two thumbs on one hand and one out of 2 million have doubling at the wrist, resulting in two hands." 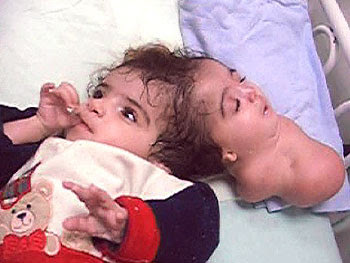 Baby born with two heads: "Rebeca was born with the undeveloped head of her twin. Fully developed twins born conjoined at the head are extremely rare, accounting for one of every 2.5 million births, but these twins, where one twin stops developing, are even rarer." "Syafitri, an Indonesian baby born with two heads, the four-day-old baby girl weighs 7 pounds and 450 grams". Manar Maged was originally one of conjoined identical twins, but her sister didn't develop. "Manar Maged was an Egyptian girl, born with a condition - a type of conjoined twin where the twins are attached at the head and one doesn't develop completely, becoming completely dependent upon the other". 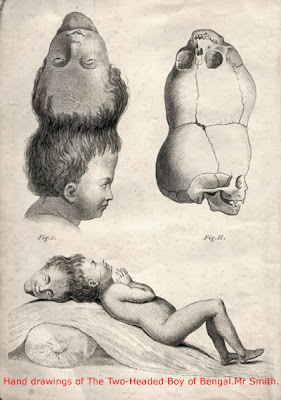 "Two-headed boy of Bengal who was born in 1783 & remains are with the H.M of the Royal College of London".